CoolCart WordPress Theme’s responsive design is developed by Templatic.com team . It will ensure that the theme works and looks great on all devices. The width of the theme will adjust automatically based on device you’re using. To test this open the demo and resize your browser window. For the ultimate test simply navigate to the demo site with your phone..
WooCommerce compatibility enables unparalleled flexibility when it comes to selling. Dozens of payment gateways are available as extras allowing you to provide even country-specifica gateways as payment methods. Customizing the CoolCart homepage is easy as drag n’ drop, literally. Widgets allow you to populate the homepage with various content while still preserving that clean and beautiful look! 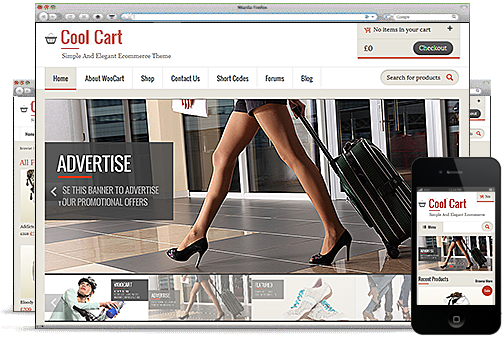 To help customize your posts and products CoolCart comes with a wide selection of shortcodes. Some of them are standard in most other Templatic themes while some are completely new and designed with CoolCart in mind. Visit the demo site to see them in action. Share news and promotions with your visitors by maintaining a blog. In CoolCart, WordPress posts are used as blog posts. To start a blog simply create a category and begin writing!